Every now and then someone says it so well, it just needs to be read as is. So it is with this piece written by M. Northrup Buechner, Associate Professor of Economics at St. John’s University in New York, as featured in Forbes Magazine. Finally, what we have all been witnessing and addressing is drawing the attention of the financial elites who read the pages of this prestigious magazine. It is my hope that Dr. Buechner retains his position at St. John’s University because the lawless Barack Obama will unleash his hounds to destroy him. Let this be a message to John Boehner and Mitch McConnell and all Republicans. Take heed, the future of our Constitutional Republic lies in your hands — and cowardice and failure are not an option. 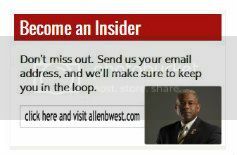 This entry was posted in Conservatism and tagged AllenWest, allenwestrepublic.com, BarackObama, Col Allen West, John Boehner, LTC Allen West, M. Northrup Buechner, Mitch McConnell, New York, Republic, Republican, St. John’s University, United States. Bookmark the permalink. We Must Organize, the Republicans must hold the House and take the Senate. Then the first order of Business is the Impeachment of Obama, Eric Holder, full investigation of Benghazi, IRS, Eric Holder, AP & DOJ. Criminal trials for Obama, Holder, Clinton and all others found to be involved.